ECS is pleased to announce the addition of Ziacanaia to it's fleet. Now Available for charter in the Caribbean. The luxurious yacht Zicanaia offers incomparable volume for her range, complimented by sophistication and elegance throughout. The Navetta 26 offers fine lines on the exterior, with design focusing on comfort underway or at anchor, compliments of the Zero speed and fin stabilizers. Emphasis is placed on the environment, with the yacht offering great consumption efficiency. The interior design delivers increased space. Every detail adds to the ambiance of refined comfort and relaxation. From the carefully selected light colored woods, to the subtle colors used throughout. The spacious cockpit leads through to the main dining room and salon. Big windows offer a bright and welcoming ambiance. Forward on the main deck, a good size galley is tucked away on the starboard side, not visible to guests. Enter the luxurious owner’s suite, complimented by large windows and lovely views. Well appointed with a queen bed, spacious en suite, large walk in closet and thoughtful details such as minibar, and 32 inch TV with access to media system. Below the main deck, a grand and noticeably larger full beam VIP awaits. Large portholes offer excellent light. This luxurious stateroom offers large walk in closet, luxurious en suite and again thoughtful details such as minibar, and 24 inch TV with access to media system. Port Aft on the same deck as the VIP you will find a third guest stateroom, with a double bed that may be separated into twins, well appointed en suite, large porthole for natural light, 20 inch TV with media system access, and surprisingly large storage! The starboard aft offers twin beds, e suite, 17 inch TV and a Pullman for a young one! The highlight however is what awaits upstairs! A favorite whilst under way, behind the helm, the upper salon offers lovely views, cozy breakfast table and seating. You exit onto the sun deck with more seating, sun beds, Jacuzzi, BBQ, minibar and perfect for the Caribbean – an ice machine! This yacht is perfect for entertaining! On the main deck, forward also offers spacious sun beds, perfect for relaxing over short passages! Aft, you will find a large swim platform which is lowered at anchor! ZIACANAIA is fully air conditioned through out. ZIACANAIA can accommodate 8 guests in 4 cabins. The Master cabin has a queen size bed, shower and toilet. A VIP cabin has a queen size bed, shower and toilet. A Guest cabin has a double bed, shower and toilet. A Guest cabin has a twin bed, a pullman, shower and toilet. 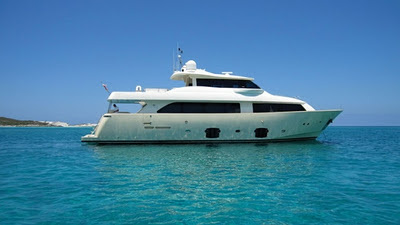 Luxury Yacht SEAS THE MOMENT NEW YEAR'S SPECIAL!